If you are a past student or staff member of BCC and would like to reconnect, you can contact us on alumni@bcc.act.edu.au, sign up for our new Alumni Community page or like our Facebook page for regular updates on Alumni news and archival photographs! 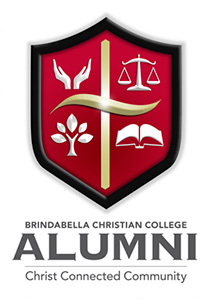 To give our Alumni association a true identity, BCC commissioned the design of a new Alumni logo. This logo incorporates symbols and themes from throughout Brindabella’s history. We have recently launched our comprehensive Alumni Community page, which provides a secure online space for Alumni to connect, plan and share with one another. Our Class of 2012 Alumni were invited to attend the BCC Graduation Ceremony to ‘pass the baton’ to the 2013 Year 12 Class. The 'passing of the baton' tradition has continued each subsequent year .